The best graduation speech, ever. It’s that time of year. I seldom pay much attention to graduation speeches. I can’t remember anything said at my own, nor do any quotes come to mind from celebrities whose commencement addresses get soundbytes played on the news every June. But there is one graduation speech I’ve read and listened to many times and continues to be a source of inspiration. You may know it. If not, I’m happy to pass it on. I invite you hear everything this visionary had to say that day, in a text version of the speech, and / or this video clip. This entry was posted in Culture, Education, Imagination and tagged Creativity, Culture, Education, imagination, Steve Jobs. Bookmark the permalink. 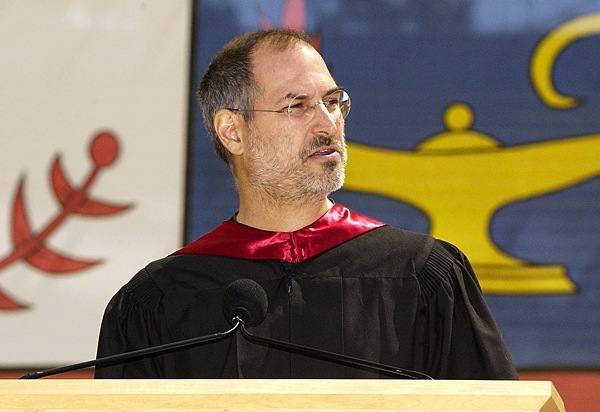 5 Responses to The best graduation speech, ever. I’ve been through 6 or 7 graduation ceremonies, and all that I remember from them are vague impressions. I remember that the valedictorian of my older brother’s graduating class gave a fantastic speech, whereas the salutatorian of my class – who was one of my best friends throughout school – gave the single worst speech that I heard at any of the ceremonies. I believe you’ve posted this speech before, and I probably commented that I really enjoyed it. So I suppose I should say again that it’s a wonderful speech, and thank you for posting it. It’s a speech well worth posting multiple times, and it’s always good to have clips for the speeches if you can find them. This is a great, inspirational speech. This time of year we are reminded of many of the great graduation speeches, but this is one of the best. Reading it, I realized times have changed a lot since he and we were young – it’s a lot harder to simply explore options or go trekking India – and yet the basic question – what do you want to do, giving a limited amount of time, still demands an honest answer from us all.